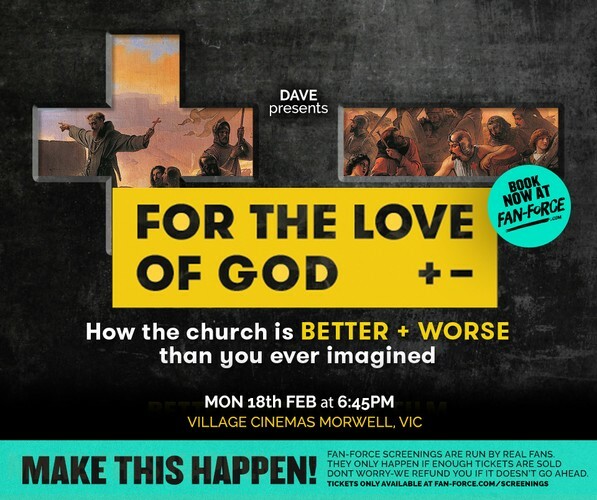 Dave brings you this special screening of For The Love of God. Make sure you arrive early because the film will start at 7pm sharp! For The Love of God confronts the worst that Christians have done and traces the origins of Western values like human rights, charity, humility, and non-violence back to the influence of Jesus. This is not the history we think we know. Join us as we weigh up the good, the bad, the ugly—and the unexpected—about the impact of Christianity on the world we live in today.